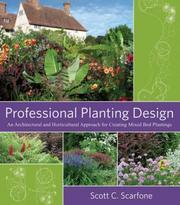 This is a great reference book for planting design, which is an arena where so many of us are hugely challenged. Information in it is well written, engaging, useful, accessible, and original. — Holly H. Shimizu, Executive Director, United States Botanic Garden “A unique blend of classic planting-design principles and ecological plant-selection criteria.” — Scot Medbury, President, Brooklyn Botanic Garden “After reading the book, you will be able to experiment with nature and use its myriad of facets to make your own original statement. You will be ready to take risks and design exciting and original gardens.” — From the Foreword by James A. van Sweden, Oehme, van Sweden & Associates A comprehensive guide to the “high art” of designing mixed bed plantings When done successfully, mixed beds represent the pinnacle of planting design — a living work of art in which small trees, shrubs, perennials, grasses, bulbs, tropicals, and groundcovers combine to create a true feeling of place. Professional Planting Design initiates you into the principles of planting design and helps you develop the ability to think about the planting design process, so that you can develop your own effective compositions that sustain multi- seasonal interest. Richly illustrated with photographs and drawings, Professional Planting Design covers the basics as well as the advanced concepts of planting design including: selecting plant characteristics, types of mixed bed plantings, structuring and composing mixed beds, creating mixed palettes for seasonal variation, designing in elevation and plan view, and choosing plants. You’ll find coverage of design, landscape architecture, and horticulture interwoven throughout the guide, along with detailed steps for developing mixed bed planting compositions at a variety of scales for projects on both residential and commercial sites. Clear and concise yet thorough, this book will supplement your talent with the knowledge you need to create harmonious mixed plantings in the landscape that will provide continual interest throughout the seasons.